The Independent Contractor or Employee? 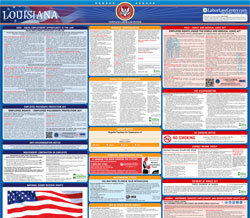 is an employee classification law poster by the Louisiana Office Of Human Resources. This is a mandatory posting for all employers in Louisiana, and businesses who fail to comply may be subject to fines or sanctions. This poster must be posted in a conspicuous place where all employees will see it. This poster discusses what an independent contractor is and employer consequences for misclassifying a worker as an independent contractor. It appears you don't have a PDF plugin for this browser. Please see the link below to download louisiana-ind-contractor-or-emp-color.pdf. established trade, occupation, profession or business. AN EMPLOYER TO MISCLASSIFY EMPLOYEES  AS INDEPENDENT CONTRACTORS OR PAY EMPLOYEES OFF THE BOOKS. required by Louisiana and Federal Law. •  Prohibited from contracting with any state agency or  political subdivision of the state for three years.